The activity was determined by the dose-dependent stimulation of the proliferation of mouse D10S cells using Promega CellTiter96® Aqueous Non-Radioactive Cell Proliferation Assay. 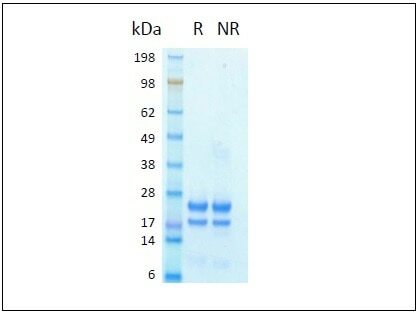 The protein was resolved by SDS- polyacrylamide gel electrophoresis and the gel was stained with Coomassie blue. R represents reducing conditions and NR represents non-reducing conditions. Lyophilized proteins are stable for 1 year from the date of receipt if stored between (-20oC) and (-80oC). Upon reconstitution we recommend that the solution can be stored at (4oC) for short term or at (-20oC) to (-80oC) for long term. Repeated freeze thaw cycles should be avoided with reconstituted products. Briefly centrifuge the vial before opening. It is recommended to reconstitute the protein in sterile 1xPBS containing 0.1% endotoxin-free recombinant human serum albumin (HSA). Animal-free Recombinant Human IL-1 beta expressed in human 293 cells has a very high activity with a typical EC50 of ≤0.1 ng/mL using a bioassay to measure stimulation of the proliferation of mouse D10S cells. In comparison with the E. coli expressed protein, IL-1 beta is 50% more potent promoting human CD4+ T cell differentiation into Th17 cells. This cytokine is important for inflammatory responses. It is also involved in a variety of cellular activities which includes cell differentiation, proliferation, and apoptosis. It is produced in a serum-free, chemically defined media. 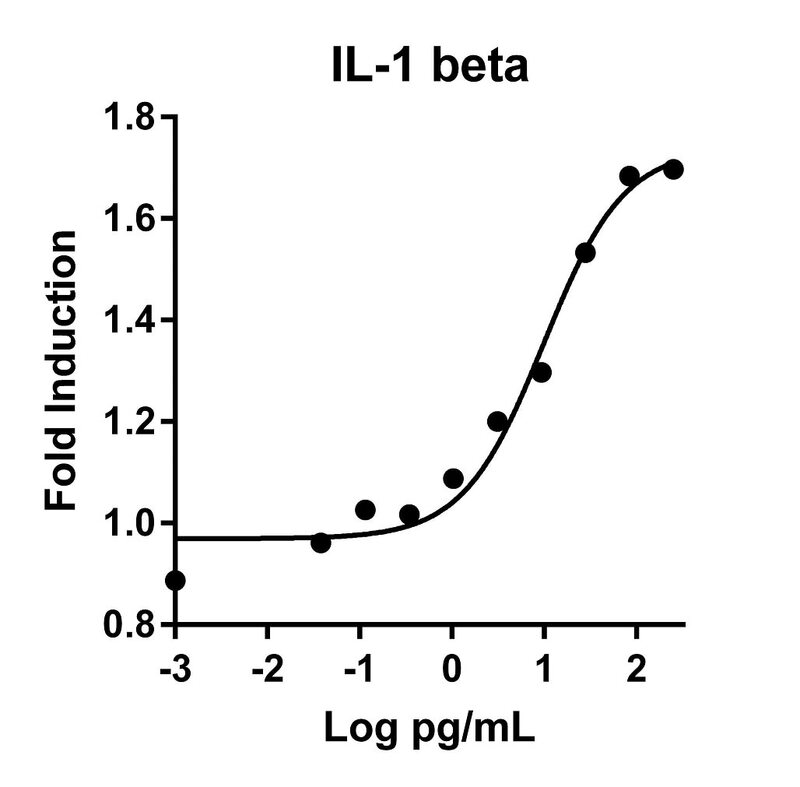 Interleukin-1 is a pro-inflammatory cytokine with multiple biological effects. The IL-1 gene family encodes three proteins: IL-1α, IL-1β and their naturally occurring inhibitor Il-1RN. Interleukin 1β(IL-1β), mainly produced by blood monocytes and tissue macrophages, has been implicated in mediating both acute and chronic inflammation. IL-1β is known to be involved in a variety of cellular activities, including cell proliferation, differentiation and apoptosis. IL-1β is emerging as a key mediator of carcinogenesis that characterizes host-environment interactions (PMID: 8630372; PMID: 12401481; PMID: 23704929; PMID: 24618930). Regulation of human Th9 differentiation by type I interferons and IL-21. Characterization of protective human CD4CD25 FOXP3 regulatory T cells generated with IL-2, TGF-β and retinoic acid. IL-33 induces IL-9 production in human CD4+ T cells and basophils. Analysis of cytotoxicity induced by proinflammatory cytokines in the human alveolar epithelial cell line A549. Systemic transplantation of allogenic fetal membrane-derived mesenchymal stem cells suppresses Th1 and Th17 T cell responses in experimental autoimmune myocarditis. IL-1 family members IL-18 and IL-33 upregulate the inflammatory potential of differentiated human Th1 and Th2 cultures.